Trend Spotted: cargo pants. 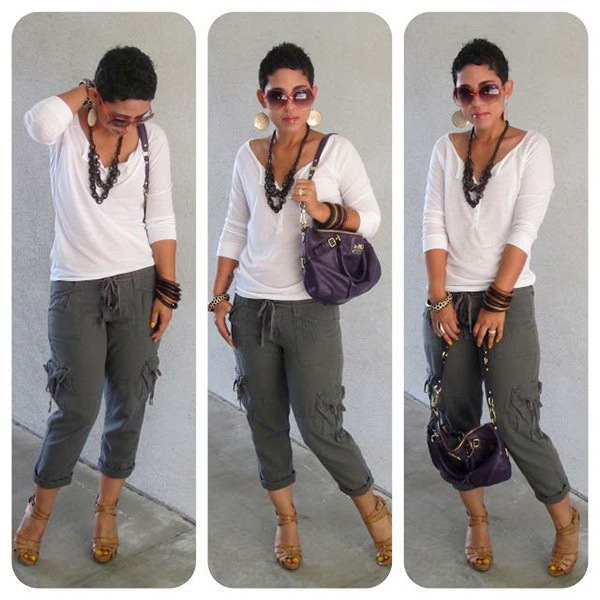 I'd like to share with you some of the best 15 ways to wear cargo pants this year. It feels like this year is army-inspired, as I see utility jackets, camouflage prints, cargo trousers and other military garments everywhere appearing on the streets. Indeed, many designer brands have interpreted classic army pieces to make them fir your everyday looks. 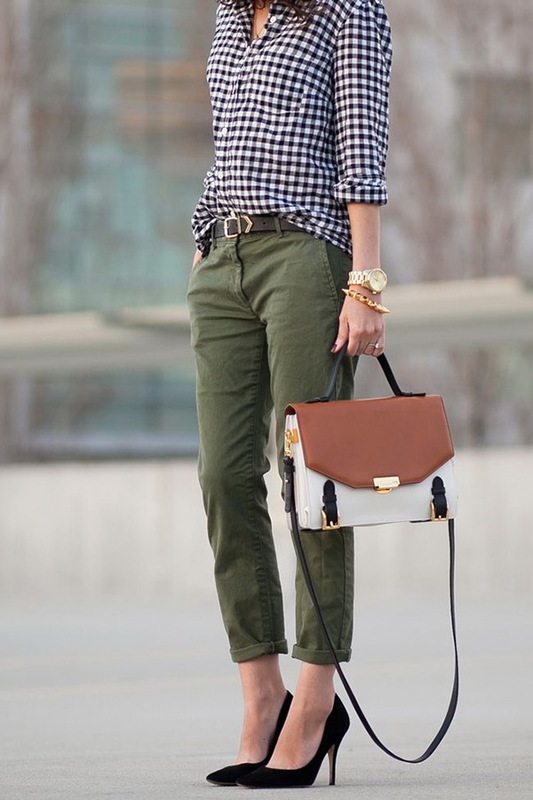 In this post I am going to show my favorite outfits featuring cargo trousers. Sometimes jeans can get pretty boring, that's why cargo pants were reinvented to brighten up our outfits. Keep it casual and relaxed. Try on loose-fit white long-sleeve top and pair it with cool khaki grey cuffed cargo pants. Complete the outfit by adding awesome sunglasses, cool necklace, eye-catchy bracelets and purple leather shoulder bag. 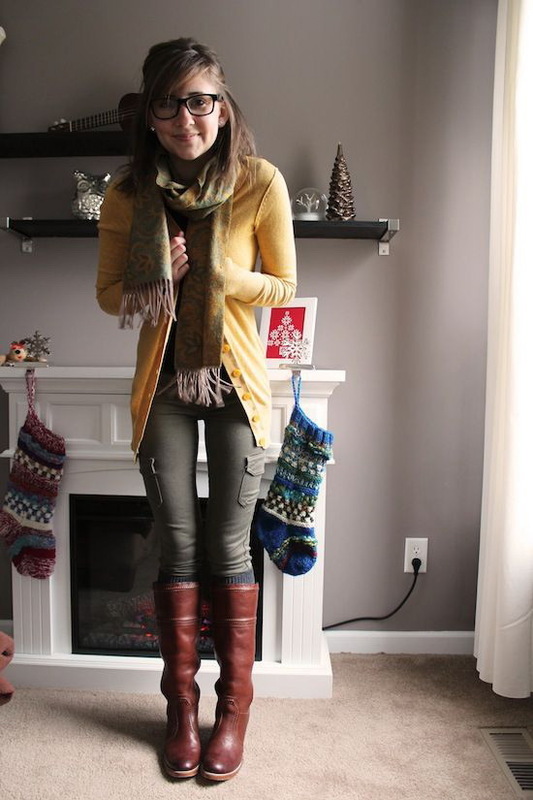 In this post you gonna see lots of khaki color designs. You probably going to see quite often this autumn hue. You can find this color pretty much everywhere around, starting from cargo vests to cargo shorts and of course cargo pants. Why do so many women wear these mannish looking bottoms? The answer is quite easy: they are extremely comfortable and ideally suit your favorite everyday essentials. You can try them on with gingham tops for a casual look, go for loose-fit sweaters, add classy button-down and fitted blazer, go simple with striped shirts, keep things super easy by pairing white tee with denim jacket, etc. As you have already understood, there are plenty of outfit ideas.